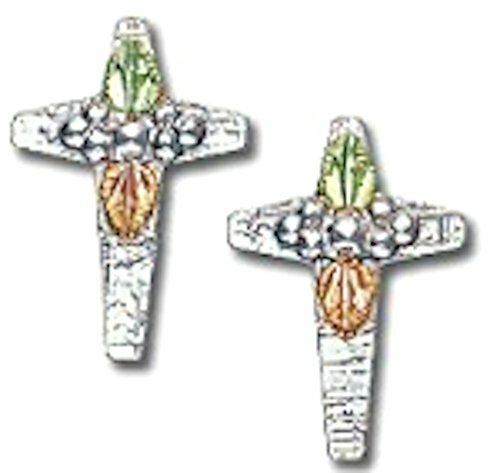 Silver Cross Earrings with 14k white gold posts with stainless steel friction backs. Petite Hand-Engraved, Hand-Placed, Satin Finished 14k Green and Rose Gold Leaves. Designed just for you in South Dakota, USA. Earring Measures 0.5" inch by 0.33" inch. Usually Ships in 2 Days. Certificate of Authenticity and Manufacturer's Limited Lifetime Warranty Included. 14k white gold posts with stainless steel friction backs. Earring Measures 1.78" inch by 0.6" inch. Certificate of Authenticity and Warranty Included.